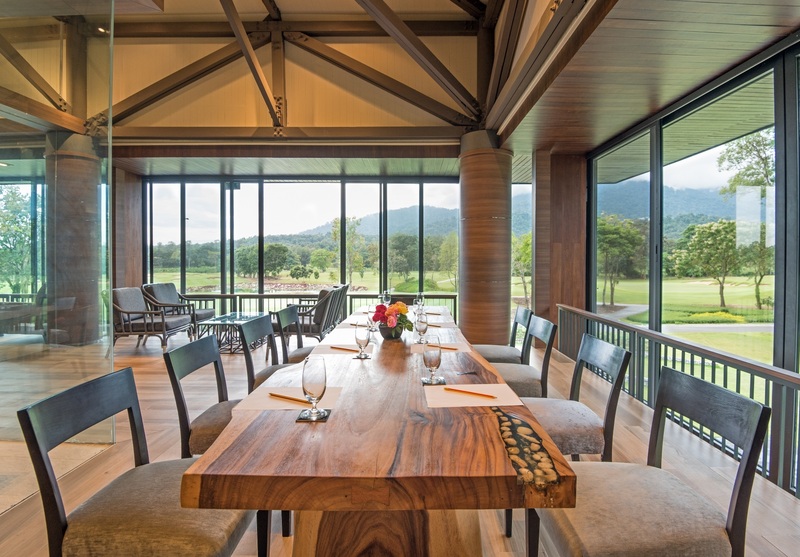 If you’re looking to turn your special event into a real occasion then look no further than the stunning surroundings of the breathtaking highland sanctuary at Chatrium Golf Resort Soi Dao Chanthaburi. Situated in the rural countryside of one of Thailand’s most beautiful provinces with the rolling hills and imposing height of Soi Dao Mountain acting as the perfect backdrop to your day the near 1,600 acres of Chatrium Golf Resort Soi Dao Chanthaburi, with its verdant lush greenery and award-winning Denis Griffiths-designed international class 18-hole golf course, is waiting to welcome you for an event that exceeds your wildest expectations. Chatrium Golf Resort Soi Dao Chanthaburi can cater for any type of function, from memorable meetings to fairytale weddings and pulsating parties, all prepared to your exacting requirements by a professional and dedicated events and catering team meaning you don’t have to worry about a thing leaving you to simply enjoy your time with us. The Club House can accommodate up to 120 guests and with a size of 18 meters by 25 meters complemented by a high ceiling and scenic views of Soi Dao Mountain will make your corporate function, birthday party, engagement party, wedding ceremony, wedding anniversary or any type of event with your nearest and dearest one filled with perfect memories. Meeting packages are available for half days at only THB 550 net per person or full days at THB 700 net per person and come fully equipped to ensure your day is an unrivalled success with a stage, LCD projector, microphones and sound system with a choice of enticing international buffet menus prepared by our Executive Chef and his team starting from as little as THB 550 net per person including soft drinks. Doesn’t that once in a lifetime wedding deserve a once in a lifetime day? With Chatrium Golf Resort Soi Dao Chanthaburi’s opulent wedding packages you’ll have an eternity’s worth of picture perfect memories to share with your loved ones. You’ll be entitled to a host of exclusive inclusions such as a traditional Thai wedding ceremony and water pouring blessing, a wedding lunch or dinner at the Club House, a romantic Honeymoon Suite for the bride and groom with Soi Dao Mountain view, a THB 2,000 voucher to help celebrate your wedding anniversary, a voucher to play a round of golf on our award-winning course, a complimentary wedding picture at the golf course and swimming pool and full use of all the resort’s facilities. Or for a more intimate affair of up to 40 guests your dream day can add that extra element of perfection with an al fresco party beside our azure blue shimmering swimming pool for a wedding that will be talked about for many years to come. For further information on how we can turn your special event into a real occasion please contact +66(0) 89 9343008, visit www.chatrium.com, or Email: info.sdao@chatrium.com.